Secure HTTPS connections using TLS1.2 Encryption. Will post to regular HTTP connections. Quickly display data on third party websites: VegeCloud.com, and ThingSpeak. Configurable URL allows it to post data to any website. Posts the device host name to networks scanners, for easy configuration. Box has flanges and screw holes for easy mounting. Easy to mount and compact. Control and monitoring of sprinkler systems. Control and monitoring of heaters. Control and monitoring of water tanks. Control and monitoring of lighting systems. What will you Control with the WiFI Control Hub? The applications for the VegeHub WiFi control hub are limitless. Control anything from anywhere with input from local or remote sensors. It can control water pumps, sprinkler systems, alarms, lights, heaters, fans and valves. The VegeHub WiFi control hub has all of the functionality of our standard 4 input sensor WiFI hub with the addition of a high capacity 16A 250V relay, which can turn on or off nearly any electrical device. The relay can be controlled by settings from the local sensor inputs, or from an external web link, which you specify. View your sensor data from any web browser on your phone or computer. Get text messages and emails from sensor triggers. Within minutes you will be able to setup the VegHub and send data to common 3rd party web sites such as: VegeCloud, ThingSpeak, and Adafruit. Get creative with how you use the WiFi control hub. For example, you can monitor and control chicken water tanks with AquaPlumb Sensors, and get an alert when the water is getting low. You can remotely control the soil moisture and temperature of your garden or greenhouse using VH400 soil moisture sensors, and THERM200 soil temperature sensors. You'll probably come up with applications we haven't even though about. Drop us a email if you do, and we'll post them on our site. The VegeHub uses TLS 1.2 SSL for secure Internet connections, allowing it to do secure HTTPS posts to servers. If you don't care about security, you can still post using regular HTTP. The VegeHub comes with the most commonly used website certificates, or using our certificate tool, you can install your own. One of our primary design goals for the VegeHub was long battery life. We wanted you to be able to place this anywhere without worrying about power connections. Under normal use scenarios batteries will last over a year. 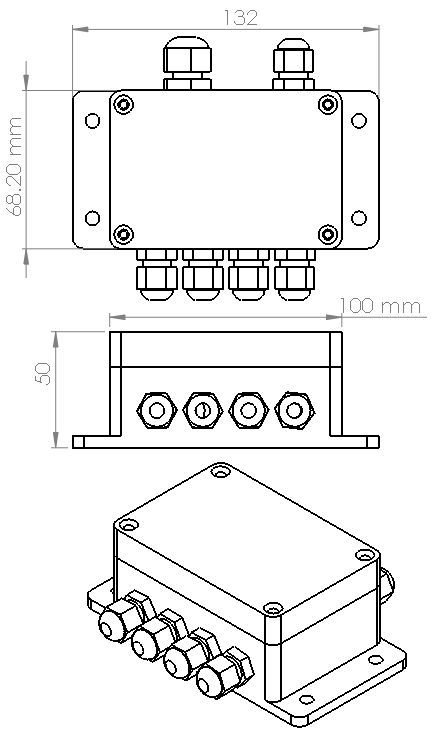 We designed the hub with a power efficient latching relay. Power is only consumed for 40 milliseconds when the latching relay changes state. The rest of the time it consumes zero power, even when the relay is engaged. The hubs come with a battery cable clip, suitable for standard 9V batteries. If you are using power from an adapter, you can replace the clip with your own wires. For extended durations we recommend using a 9V AA battery pack with 6 AA batteries. We sell 9V AA battery holders. Use lithium batteries if the location will get cold. You can configure the VegHub to send it's battery voltage when it updates to the server, so that you can monitor its level. Battery life depends on your sample frequency, and update rate. Most agricultural sensors change rather slowly, and so a sample rate of once per hour is often sufficient and will extend your battery life. Make sure you don't put batteries inside the box, because it is air tight, the batteries will off gas acid in the heat corroding the components. You can configure the VegeHub and add it to your local WiFi network by using a browser on your phone or PC. Once you have connected it to your network you can plug in a USB thumb drive, and it will write its IP address to a file. This IP address allows you to configure it through it's web interface. To configure it, press a button, and it will become a mini web server on your network, and serve up configuration pages. Examples of the configuration pages are provided below. These pages allow you to select the cloud site to which you want the hub to report data. Each channel can be independently configured with multiple options. For example channels can be configured to sample data periodically or, can be trigger on an event. The sensor warm up time is configurable, as well as how often the hub reports to the server. If your sensor is just a push button switch	you can configure the channel to have pull up or pull down resistors. See the Quick Start Guide for step by step instructions. The VegeHub will connect with websites such as VegeCloud, ThingSpeak, or io.Adafruit out of the box. These sites will graph your data, and allow you to create actions, such as send an email, when your sensor	data has crossed a particular threshold. We especially recommend: VegeCloud.com which will store your data, and allow you visualize it with graphs, and allow you to set triggers on your data so that you can get text alerts and email messages, when your sensors have passed a threshold value. If you want to post to your own website, this is also possible, using our simple VegeHub API. You can put this box outside in the rain or snow. The rugged ABS plastic box has silicone rubber gaskets making it waterproof. All of the cable entry points use cable glands, so that no water or insects can get in. The box has flanges and screw holes for easy mounting, so that you can put it anywhere. Our product philosophy is simple. We provide low-cost modular building blocks to our customers, and then let them come up with their own applications. Get creative with our very unique sensors, WiFi Hubs, Relay Boards and come up with your own creations. If you aren't amazed and delighted by your new VegeHub,	return it for a refund within 30 days. The following screen shots of the VegeHub's web interface show how the VegeHub can be flexibly configured. Power consumption Sleep mode: 35uA. Add 12uA for each edge triggered channel. Server update mode: 38mA for about 2.5 seconds. Sensor read mode: 11mA + the current consumption of the sensor. Relay Change State: 200mA for 40 milliseconds. If you intend on powering the VegeHub from a battery, battery selection is very important. Not all batteries types act the same in different environmental conditions. For example alkaline batteries do not do well in cold temperatures. For temperature extremes Lithium Ion batteries are best, with a typical range of -40°C to 60°C. If you need off the shelf disposible batteries we recommend Energizer Ultimate Lithium batteries. Their 9V battery has a 700mAh capacity, and their AA have a 3500mAh capacity. If you use the AA batteries we recommend that you get a 9V or 12V AA battery holder to supply power to the VegeHub. Rechargeable 3.7V Lithium Ion 18650 batteries are also a good choice, for environmental extremes, and for long life. Two batteries in series is sufficient to power the VegeHub. Because batteries off-gas acid, especially in hot environments, never place batteries inside the VegeHub enclosure, as this will corrode and destroy the electronics, over time. WARNING: The VegeHub has an internal high voltage relay. To prevent accidental electrocution, before opening the enclosure or configuring it, turn off any high power source to which the hub is connected. WARNING: The high power relay may switch on or off at any time, unexpectedly, and in turn unexpectedly turn on or off any devices that are connected to the hub's relay. Before touching any equipment that is controlled by the VegeHub make sure that any power running to the equipment is turned off. WARNING: Don't use the hub in situations where it's failure could cause damage to property, or harm to people or animals. 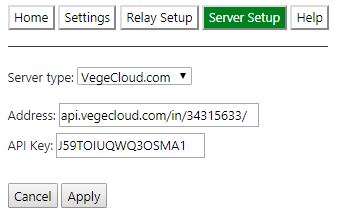 Connect the VegeHub to a remote server with the VegeHub Quick Start Guide. Root certificates allow the VegeHub to communicate with servers using secure HTTPS. The VegeHub has factory installed root certificates for the most common IOT servers. Some web sites will require SSL certificates that are not already included on the VegeHub. See the VegeHub Root Certificate Manual for information on updating root certificates. The VegeHub has a USB port which is used to update root certificates, configure its settings, and get its status information. To install device drivers for the USB, and to configure it, see the VegeHub USB Manual. Upon Power Up All 3 LEDs are lit. Most likely the battery has too low a voltage and needs to be replaced. Red LED is blinking Failure to connect to the WIFI network. Green LED is blinking Failure to connect to the server. Could be that you have bad SSL certificates, and need to update them. Yellow LED is blinking Failure to get the Internet time. It could be that the NIST timeservers are down. Can not connect a laptop or phone to the Hub as a WIFI hotspot. Make sure that the red LED is lit. It should be the only LED lit. If all 3 LEDs are lit then most likely you have a bad battery. Use a voltmeter to test the battery voltage and make sure that the voltage is above 6V. Can not bring up the setup pages on the hub. Make sure that the yellow LED is lit, and is the only LED that is lit. Make sure you have the right IP address for the hub. Make sure that you have any firewalls turned off that might be blocking it. I've set up my own private web server on a Raspberry PI, but the hub is not posting data to it. Many computers have built in firewalls. Make sure you have allowed access to your web server, and it's port.